April 19, 2019 by Reg Hub Leave a Comment Filed Under: Central Bank Annoucements, Central Bank News Tagged: debt distress, IMF, SDG, sustainable development, World Bank, World Trade Organization. Recent setbacks in financing for development should therefore focus policymakers’ attention on the need for decisive national strategies so these best intentions might be realized. Harnessing the necessary resources could be achieved through a combination of revenue mobilization, attracting private finance, and supporting financial sector development. Policy makers will need to engage in collective action and practice a new multilateralism in support of global goals. A new UN study, prepared with significant contributions by the IMF, the World Bank Group, the World Trade Organization, the United Nations Development Program and other UN agencies, takes a deep dive into how countries and the international community are faring in mobilizing the needed financing. The financing needs are not small change—an IMF study earlier this year estimated additional annual spending needs by 2030 would be $2.6 trillion in low-income and emerging markets for the big-ticket SDGs delivering education, health, power, roads, water and sanitation to growing populations. The financing challenge is particularly large in low-income and fragile states given their low starting point, rapid population growth, and often weak growth trajectory accounting for one-fifth of the total financing needs. The UN report also notes that some recent developments may make mobilizing financing more difficult. Global growth has likely peaked, trade restrictions are intensifying, some emerging markets are experiencing capital flow reversals, and debt risks are rising with about thirty low-income countries at a high risk of debt distress or in debt distress. We are indeed at a delicate moment for the global economy as the IMF Managing Director remarked earlier this month. Develop a financing framework. Financing is often the weakest part of national SDG plans: a recent study showed that over three-quarters of 107 national plans do not contain costings or financing details. The report makes concrete recommendations on how to operationalize a financing framework and illustrates how some countries developed plans identifying both public and private flows. Medium-term revenue strategies. The report recommends building a national consensus for medium-term revenue strategies that can support reforms through the political cycle by highlighting the link between additional revenues and effective and equitable public services. Indonesia provides a good example of an ambitious revenue strategy that aims to raise revenue from 10 to 15 percent of GDP over the medium term (explained in this IMF book ). Revenue strategies may be bolstered by global coordination on international corporate tax reform. Actions to support debt sustainability. An in-depth discussion of debt risks provides a rich menu of actions to help countries spot vulnerabilities early on, and better manage their debt. The report highlights that all debt crisis situations are different and discusses ongoing efforts and challenges for debt-restructuring in the Gambia, Republic of Congo, and Mozambique. Prepare for future crises. Even the best laid plans, strategies, and tools may not prepare developing countries adequately for future financial crises and spillovers from advanced economies. The report reiterates the importance of ensuring the adequacy and comprehensiveness of the global financial safety net, including through the ongoing review of IMF financing arrangements. While the financing challenges are large, they are not overwhelming for most countries. Particularly strong efforts will be needed to move the needle in Africa and parts of the Middle East, with national policies to support SDG investments, and international cooperation to find solutions to new and emerging challenges. The Financing for Sustainable Development Report makes an important contribution to identifying necessary actions. Summary: The Yen outperformed, rising 0.3% against the US Dollar as fears of a global recession resurfaced. The IMF downgraded its outlook on the global economy while the Trump administration threatened tariffs on the European Union. China-US trade talks are still unsettled. Risk appetite and the Dollar Yen took a hit. USD/JPY slid 0.30% to 111.16 from 111.48 yesterday. The Dollar Index (USD/DXY) recovered to end little-changed at 97.020 (97.062 yesterday) after falling to 96.858, two-week lows. Sterling slipped to 1.3055 from 1.3065 as the EU looked set to force the UK to delay Brexit for as long as a year. The Euro finished at 1.1265 (1.1262) after trading to 1.1284, a 2-week top. The risk-off mode hit Wall Street stocks, ending an 8-day rally. The DOW slid 0.74% to 26,143. The S&P 500 lost 0.6% to 2,878. Treasuries rose pushing bond yields lower. The US 10-year bond yield slid back to 2.50% (2.52%). US JOLTS (Job Openings and Labour Turnover Survey) for February fell to 7.09 million from 7.58 million in January, the lowest level since March 2018. EUR/USD – The Single currency rallied to 1.1284, fresh 2-week highs where it faced strong resistance, slipping back to end flat at 1.1265. The ECB is expected to keep rates unchanged, but traders will be looking at the Press Conference after the meeting. Policymakers may further delay their 1st rate hike to early 2020. USD/JPY – The Yen outperformed all currencies, climbing 0.3% against the US Dollar as risk appetite soured. US 10-year treasury yields slipped to 2.5% from 2.52%. USD/JPY closed at 111.16 after trading to 110.979. GBP/USD – Sterling closed marginally lower at 1.3055 (1.3065). British PM May is set to meet with European political leaders to try and break the Brexit gridlock ahead of the EU’s crucial summit meeting on Brexit. AUD/USD – The Aussie Dollar rallied to a high of 0.71527 mainly on the back of a generally weaker Greenback. Australian Home Loans for March saw an unexpected rebound, up 2% against a forecast fall of 3%. AUD/USD slid back to finish at 0.7125 in New York. On the Lookout: A busy, first-tier event day lies ahead with the ECB’s policy meeting, US CPI report (March), the EU’s Council Summit meeting on Brexit and the FOMC’s March meeting minutes. Other data releases are mostly second-tier. Japanese Bank Lending and Preliminary Machine Orders (March) start off the day. Euro-area data follow next with French and Italian Industrial Production reports for March. First-tier UK Manufacturing Production, Construction Output, Goods Trade Balance, and Industrial Production data follow next. All eyes will then be on the European Central Bank’s policy meeting, the EU Summit, US Inflation Report and March FOMC Meeting minutes release. Trading Perspective: The Dollar Index (USD/DXY), of which almost 60% of its weight is the Euro, bounced off it’s lows to close mildly down at 97.020 (97.062). This is just above it’s immediate support. The Euro pared gains ahead of today’s ECB meeting where most analysts expect no change in policy. Traders will look for additional details on the ECB’s Longer Term Repurchase Operations (TLTRO). EUR/USD – The Euro was unable to break up through immediate and strong resistance at 1.1285. This remains a barrier today, a break of which should see 1.1325 next. Immediate support lies at 1.1240 followed by 1.1200. With the ECB meeting looming, look for the Euro to consolidate between 1.1245-85 first up. Look to buy any dips toward 1.1200-40 area. The big short squeeze could be just around the corner. USD/JPY – The Dollar is slip-sliding against the Yen in the current environment. The 2-basis fall in the US 10-year yields was not matched by its Japanese counterpart. The latest COT report for the week ended 2 April saw net speculative JPY shorts to their biggest since January (-JPY 62,741 vs previous week’s -JPY 62,121). USD/JPY has immediate support at 110.90-111.00 (overnight low 110.979). The next support level lies at 110.50. Immediate resistance can be found at 111.35 followed by 111.55. Look to sell rallies with a likely range today of 110.90-111.30. AUD/USD – The Aussie slipped back to 0.7125 from its high of 0.71522 on the market’s risk-off stance and lower assets. At the end of the day, the Australian Dollar is quoted against the US Dollar. Any further general USD weakness will translate into Aussie strength. The latest COT report saw net speculative Aussie short contracts to their highest since November 2018 (-AUD 55,743 contracts). AUD/USD has immediate support at 0.7115 followed by 0.7090. Immediate resistance can be found at 0.7150 followed by 0.7180 and 0.7200. Look to buy AUD/USD on dips toward 0.7110 today. It is a great pleasure for me to be in the midst of such an august gathering today. First of all, I would like to thank Honourable Steven Marshall MP, Premier of South Australia for the invitation to attend this Summit 2019 and share my thoughts, as a central bank governor and regulator of the banking sector in Mauritius, on cross-border regulation of Digital Assets. I would also like to thank Loretta Joseph, Fintech Adviser to the OECD, for having facilitated my participation to this Summit. Fintech and digital assets are areas that the Bank of Mauritius has been following closely. The international community has also shown keen interest in this sector. The Financial Stability Board (FSB), Financial Action Task Force (FATF), International Monetary Fund (IMF), Bank for International Settlement (BIS) and fellow foreign international standard setters and regulators have shared their thought, concerns and recommendations regarding fintech and digital assets. We must obviously distinguish between digital assets and central bank digital currency. While the latter are usually created and issued by central bank and is legal tender, digital assets, on the other hand, are not “legal tender, and are not backed by any government or public authority” as the Basel Committee on Banking Supervision clearly puts it. History has shown that regulatory gaps or vacuum have contributed to perpetuate fraud, led to financial crisis and undermined confidence in the financial services sector, amongst others. The BIS, in its September 2018 Quarterly Review, reported that news pointing to the establishment of legal frameworks tailored to cryptocurrencies and initial coin offerings coincide with strong market gains. There is need, therefore, for Digital Assets to be regulated. Indeed, regulation brings legal certainty, legitimacy, trust and confidence in markets and will undeniably act as a catalyst in promoting acceptance of digital assets. These regulations should, nonetheless, not be too intrusive, but rather, it must be optimal and enabling so as to promote innovation in this technology-driven sector. The Basel Committee has accordingly set out its prudential expectations related to banks’ exposures to crypto-assets and related services. The Basel Committee views that on account of their high degree of volatility, crypto-assets present a number of risks for banks, including liquidity risk; credit risk; market risk; operational risk (including fraud and cyber risks); money laundering and terrorist financing risk; and legal and reputation risks. Fourthly, inform its supervisory authority of actual and planned crypto-asset exposure or activity in a timely manner and provide assurance that it has fully assessed the permissibility of the activity and the risks associated with the intended exposures and services, and how it has mitigated these risks. As regulators, it is our responsibility to ensure that supervised institutions are operated safely and soundly and comply with applicable laws. Within that framework, however, we also have a strong interest in permitting beneficial innovations to flourish, while ensuring that the risks are appropriately managed. It is, therefore, of paramount importance to ensure that regulatory and supervisory structures are constantly adapted to changing technologies and business models for them to remain effective. At the level of the Bank of Mauritius, our approach has been characterized by open minds and open door policy. We welcome change in banks so long as they are able to demonstrate that the risks are being appropriately and adequately managed. Moreover, as all prudent central banks, the Bank of Mauritius will also pay special attention to the recommendations of the Basel Committee and require banks operating in Mauritius to ensure strict compliance thereto. Concerns have been expressed to the effect that digital assets offer some form of anonymity to its holders if not properly regulated and controlled and may be subject to heightened money laundering and terrorism financing (ML/TF) risks. In an era where ML/TF risks are assuming increasing significance and may even result in international sanctions and loss of correspondent banking facilities, regulators need to be extremely vigilant. International Standard Setting Bodies have also identified the potential ML/TF risks that could rise from digital assets and they have been prompt in providing necessary guidance. As far back as 2015, the FATF identified certain key risks associated with Crypto Assets, including ML/TF, cross border nature of operating systems and non-face to face client relationships which facilitates anonymity. In October 2018, the FATF, recognising the need to adequately mitigate the money laundering and terrorism financing (ML/TF) risks associated with virtual asset activities, adopted, changes to the FATF Recommendations to clarify how the Recommendations apply in the case of financial activities involving virtual assets. The FATF recommended countries to ensure that virtual asset service providers are regulated for AML/CFT purposes, and licensed or registered and subject to effective systems for monitoring and ensuring compliance with the relevant measures called for in the FATF Recommendations. More recently, in February 2019, the FATF announced that it is setting out more detailed implementation requirements for effective regulation and supervision/monitoring of virtual asset services providers which are expected to be adopted at the June 2019 Plenary of the FATF. As the FATF Recommendations are globally accepted standards, it is very likely that, when establishing the regulatory framework for digital assets, countries will adhere to these standards. Allow me to share the experience of Mauritius in regulating Digital Assets. Last year, the Government of Mauritius took the initiative of setting up a Regulatory Committee on FinTech and Innovation-Driven Financial Services chaired by Lord Desai and comprising amongst others Loretta Joseph, Rajesh Ramloll S.C., Deputy Solicitor General at the Attorney General’s Office, Mauritius, the Chief Executive of the Financial Services Commission, other eminent experts from in fintech regulation, blockchain as well as artificial intelligence industry and myself. The Regulatory Committee was tasked to advise on the development of a regulatory framework for fintech in Mauritius. The Regulatory Committee identified priority areas in the fintech space to be considered for regulation in Mauritius and recommended the approach to be adopted in regulating this emerging sector of activities. Further to the report of the Regulatory Committee, the Financial Services Commission, Mauritius, which is the integrated regulator for the non-bank financial services sector and global business in Mauritius, was identified as the most appropriate authority in Mauritius to promote the regulatory framework for digital assets in Mauritius. In September 2018, the Financial Services Commission issued Guidance Note on the recognition of digital assets as an asset-class for investment by sophisticated and expert investors. Subsequently, on 05 November 2018, the Financial Services Commission issued a Consultation Paper seeking feedback from stakeholders and the public on the proposed regulatory framework for the Custodian Services (Digital Asset) Licence, which allows its holder to provide custody services for Digital Assets. The Consultation Paper has now been translated in a set of Rules which became effective as from 01 March 2019, thereby positioning the Mauritius IFC as the first jurisdiction globally to offer a regulated landscape for the custody of Digital Assets. The Financial Services Commission has ensured that the distinct regulatory frameworks are in line with international standards set by institutions like the Organisation for Economic Co-operation and Development and the FATF. Mauritius has participated fully in discussions at the level of the OECD on the governance and regulation of Digital Financial Assets and the regulatory framework for this activity segment has been developed in reference to these international consultations and the FATF Recommendations have been fully considered in the regulatory approach taken by Mauritius to regulate the custody of digital assets as a business activity. As technology is a constantly evolving affair, we need to be at the forefront of the latest development. This requires specialized skillsets which might not be available in all regulatory bodies, thereby heightening the need for continued upskilling and capacity building. With the globalisation of financial services, collaboration has always been a requirement for financial services regulators across the globe. The need for cross border cooperation between financial services regulators is becoming even more crucial in relation to fintech. Adherence to a common set of standards will foster standardization of the regulation across countries and facilitate cross-border regulation of digital assets. Obviously, cross border regulation implies cooperation and collaboration between regulators. It is common practice for financial services regulators to sign Memorandum of Understanding (MoU) with their counterparts for cooperation and exchange of information in the field of conventional financial services. These MoU may now have to be extended to collaboration in Fintech and financial innovation. c. Capacity building and knowledge sharing in the field of fintech supervision for financial services regulators. The launch, in January 2019, of the Global Financial Innovation Network1 aims at acting as a network of regulators to promote information and knowledge sharing on emerging innovation trends as well as promoting joint policy work and regulatory trials by enhancing collaboration between regulators on key policy questions with the view to support the work of standard setting bodies, amongst others. All of us in this room who have a keen interest in promoting financial innovation should collaborate and support this initiative in the hope that a standardized and agreed sets of principles and practices for fintech and digital assets may unfold soon for the benefit of the market participants and regulators alike. Summits, similar to this one, acts as incubators for sharing our thoughts and vision for this innovative sector. I am confident that this Summit will foster cooperation and collaboration between regulators, investors and international organisations. I wish us all success in this area. Good Morning and welcome to the Courtney Blackman Grande Salle. When I spoke at this event a year ago, I drew attention to the difficult circumstances in which the Barbados economy found itself, the need for urgent decisive action by government and the critical supportive role of the private sector and labour in meeting the challenges ahead. We can all agree that much has happened since that time. The newly elected political administration quickly adopted the Barbados Economic Recovery and Transformation plan, with the endorsement of the International Monetary Fund. The Social Partners have been actively engaged in helping to develop a programme that achieves its objectives while mitigating the potential adverse effects on the most vulnerable. Already, we are seeing encouraging signs. Our public finances have been reordered to the extent that we are on target to achieve a primary surplus of 3.3% of GDP for FY 2018/19. Tax refund payments have resumed and the central government is now making payments on a timely basis. The implementation of the domestic debt restructuring has facilitated a reduction in the debt ratio which is now targeted to fall to 60 percent by 2033. Our demonstrated commitment to adjustment and structural reforms has garnered the support of the IDB and the CDB and our Gross International Reserves now exceed the benchmark of 12 weeks of import cover. Confidence, so necessary for investment and growth, is returning. However, we cannot relax as a sustainable path requires us to build on these successes and implement reforms including those needed to strengthen the financial management of public enterprises, improve the quality of service delivery within the public sector and enhance tax administration. These reforms when fully implemented will be closely, no doubt, aligned with your theme of “Driving Change Toward the New Economy”. The new economy is knowledge-based and services and technology driven. It promotes innovation and creativity. It is fast paced and customer-focused. The new economy is competitive and it calls for and requires resilience. It is characterised by volatility, uncertainty, complexity and ambiguity. It reminds us that change is constant. As a small open economy, we have transitioned from agriculture to one led by tourism and international business. As demonstrated last year when government altered its corporate tax structure to address external challenges in the international business sector, we have to be prepared to adapt to tectonic shifts in the economic environment. In this era of modern communications, competition may originate from within or outside our territorial boundaries. We have to be assessing constantly our ability to adapt to the threats posed by our competitors and to the potential shocks on the horizon. As an economy, we have to embrace emerging opportunities that promote diversification and enhance competiveness. Firms and industries that are reluctant or unable to adapt risk extinction. Facing this new economy, therefore, requires change. The Barbados Economic and Recovery Transformation (BERT) programme symbolizes one aspect of this change as we seek to restore economic and fiscal discipline. However, there is also a need for a change in attitudes, a change in behaviours, a change in mind-set and a change in culture. If technology is what will drive this new economy, data is the fuel. Data and analytics will better allow us to innovate and will inform real-time decision-making. From a Central Bank perspective, having timely and accurate data will allow us to monitor what is happening in the economy, to recognise trends and to make sound recommendations for public policy. More broadly, it will help Barbados to better understand our markets, whatever the sector, and to target them more precisely, so that we can best utilise what are often limited resources. It will help us to navigate the volatility, the uncertainty, the complexity and the ambiguity of which I spoke earlier. Whether your department or organisation provides the Central Bank with statistics directly, or whether it is called upon to provide information to other agencies, such as the Barbados Statistical Service, I encourage you in the public sector to cooperate, ensuring that the data you provide is accurate and submitted in a timely manner. Remember, it is based on this data that Government makes policy decisions: decisions about new taxes; decisions about expenditure cuts; decisions about capital projects. But using data to guide our decision-making is only half of the equation. The other half is our ability and willingness to embrace the changes that will come with the new economy. That is the education and motivation of which President Clinton spoke. Whether you are in the public sector or in the private sector, you will be called upon to do more with less because of the fiscal and economic constraints. Public sector leaders who now have smaller budgets need, therefore, to be more nimble and flexible, and to improve efficiency in their operations. New approaches to traditional tasks are now needed. The Bank is committed to playing its part in helping the new economy to become a reality by supporting those who will power it. The financial sector is changing rapidly, and we have to adapt. Already, the Bank is working with government and the private sector to modernise the framework for payments. And, we are automating more of our internal processes and systems to improve our service to you. The new economy is not something that will just happen. It is something that we have to make happen. Let us use this Week of Excellence to jumpstart our thinking and our actions in this area. Let us use the opportunity provided by these difficult economic times to finally resolve some of the issues with which we have struggled in the past. I want to wish you a good week of discussions and I look forward to the outcomes. Mr. Cardarelli issued the following statement today: “IMF staff and the Argentine authorities have reached an agreement on the third review of the economic program supported by the Stand-By Arrangement. Subject to the approval of the Executive Board, Argentina would have access to about US$10.87 billion (equivalent to SDR 7.8 billion) . The Executive Board’s review is expected in the coming weeks. “We commend the authorities’ policy efforts and strong determination to address macro-economic imbalances and advance their economic stabilization plan. The high fiscal and external deficits, the two imbalances at the heart of the 2018 financial crisis, are in the midst of a significant correction. Economic activity has been weak but there are good prospects for a gradual recovery. “Monthly inflation remains high and breaking inflation inertia will be a lengthy process that will require persistence and consistency in the Central Bank’s cautious approach to monetary base targeting. Staff, therefore, welcomes the authorities’ decision to extend the zero-base money growth until November and to lessen the pace at which the edges of the non-intervention zone will increase. This tightening of the monetary framework will contribute to bringing down inflation and re-anchoring inflation expectations. “The authorities have met their 2018 primary deficit target, demonstrating their resolve to eliminate the vulnerability associated with Argentina’s fiscal imbalance. Achieving a zero primary deficit in 2019 will require further restraint in government spending. Such efforts will place Argentina’s debt-to-GDP on a decisive downward path. It will be critical that high-impact social spending programs are preserved during the course of this year and beyond. “Staff is supportive of the government’s plan to undertake transparent, pre-announced daily FX auctions (of US$60 million per day that start in mid-April) to meet the federal government’s fiscal spending needs of US$ 9.6 billion. Insofar as the currency is more appreciated than the central bank’s non-intervention zone, sales will be made directly to the central bank in the amount consistent with its announced unsterilized FX purchase policy. The authorities’ strategy will allow for a smooth utilization of IMF budget support. “Weak economic activity and high inflation are taking a toll. We strongly support the authorities’ efforts to mitigate the social impact of the needed stabilization policies, including through recently announced increases in social spending (which will be accommodated with the program through an increase in the adjustor for social assistance spending from 0.2 to 0.3 percent of GDP). “Continued steadfast implementation of the Argentine government’s stabilization plan remains essential to solidify Argentina’s return to macroeconomic stability, to lower inflation, and to lay the ground for strong, equitable, and sustainable growth. A new impetus for supply side reforms will also be needed to consolidate the gains already made by the government and to ensure a sustained improvement in the living standards for all of Argentina’s citizens. I would like to start my speech by looking at developments in overseas economies. After the global economy had grown synchronously since the second half of 2016, differences in growth rates among countries have recently become evident. I consider that overseas economies have now leveled off and are in a state where due attention should be paid to the effects of various risks. According to the January 2019 World Economic Outlook (WEO) Update released by the International Monetary Fund (IMF), as presented in Chart 1, the global economic growth rate is projected to remain around 3.5 percent through 2020. However, when compared with the April 2018 WEO forecast, downward revisions are evident, as seen on the right-hand side in Chart 1. In addition, the global Purchasing Managers’ Index (PMI), as shown in Chart 2, has declined to a level seen during the global economic destabilization in 2016 for both manufacturing and services, although they are still above the 50-point level. Thus, the pace of overseas economic growth as a whole for 2019 seems to have weakened compared with that for 2018. Let me elaborate on current developments by major countries and regions. With regard to the U.S. economy, interest rate-sensitive housing investment has been weak and some soft data have been showing signs of peaking out against the background of a rise in U.S. interest rates, while growth in exports has been decelerating. Nevertheless, private consumption has been supported by tax cuts and a favorable employment situation. As for the European economy, its pace of growth has been decelerating, partly due to the effects of a tightening of European Union (EU) emission standards and the political situations in Italy and France, although domestic demand has been more or less firm. As with the European economy, the Chinese economy has been decelerating, and the impact of this deceleration on emerging economies is a matter of concern. The following factors continue to pose a risk to the outlook: U.S. macroeconomic policies and the consequences of protectionist moves, the impact these have on the global economy and financial markets, and negotiations on the United Kingdom’s exit from the EU. Future developments require close attention as the effects of these risks have already been seen in some economies. Next, I would like to turn to Japan’s economy. Starting with recent developments, the real GDP growth rate for the October-December quarter of 2018 recovered to positive territory after a decline in the previous quarter. This was partly due to the rebound from the decrease in domestic demand caused mainly by natural disasters in the July-September quarter. However, the recovery from negative growth is losing momentum amid heightening uncertainties regarding overseas economies. Chart 3 shows the real GDP growth rate and the breakdown by component. While private consumption and private business fixed investment picked up, the contribution of external demand further decreased within negative territory compared with that for the July-September quarter, partly due to an increase in imports. Although exports increased after a decline in the previous quarter, the overall rate of increase remained relatively low given a drop due to the effects of supply-side constraints caused by natural disasters.1 The low rate of increase in exports is attributable mainly to a decrease in orders from China against the background of U.S.-China trade friction and a gradual deceleration in overseas economies. Turning to the outlook for Japan’s economy, as shown in Chart 4, the medians of forecasts made by the Bank of Japan’s Policy Board members for real GDP growth rates presented in the January 2019 Outlook for Economic Activity and Prices (Outlook Report) are 0.9 percent for both fiscal 2018 and 2019, and 1.0 percent for fiscal 2020. My view, however, is that the pace of growth will be more modest than these forecasts. Specifically, I would project the growth rate for fiscal 2018 to be around 0.5 percent, as the pace of economic recovery will likely remain moderate amid the heightening uncertainties regarding overseas economies. For both fiscal 2019 and 2020, the growth rate will likely be in the range of 0.5-1.0 percent. The impact on households of the consumption tax hike scheduled to take place in October 2019 will likely be smaller than that of the previous hike in 2014, as the government will take measures to smooth out possible fluctuations in demand. Nevertheless, it is a matter of concern that the pace of expansion in consumption since fiscal 2014 has been quite slow and households’ sentiment indicators such as the Consumer Confidence Index have continued to decline since 2018 (Chart 5).2 Moreover, I consider that the pace of pick-up in Japan’s economy will likely be slow from the scheduled consumption tax hike in October onward, mainly because the heightening of uncertainties in the global economy, which I mentioned earlier, might limit business activity to a certain degree through expectations of a slowdown in external demand. Attention should also be paid to the fact that real GDP growth rates on an annualized quarter-on-quarter basis have been on a declining trend since the January-March quarter of 2018, and that the rate for the October-December quarter fell for the first time since the October-December quarter of 2014, which followed the consumption tax hike in April that year. Next, I will move on to price developments. The year-on-year rate of increase in the consumer price index (CPI) for all items less fresh food for January 2019 was 0.8 percent, as shown in the left-hand graph of Chart 6. Looking at the CPI in detail, it should be noted that the contribution of a rise in energy prices to the CPI was significant at 0.4 percentage point, and the rate of increase for all items less fresh food and energy, which directly reflects supply-demand conditions, stood at only 0.4 percent year on year. The right-hand graph of Chart 6 shows some indicators that represent the underlying developments in consumer prices. These indicators have continued to show relatively weak developments. The important indicators that affect underlying price developments are the output gap and medium- to long-term inflation expectations. The output gap, as shown in the left-hand graph of Chart 7, has remained positive, reflecting improvements in the capital stock and labor markets. Nevertheless, the positive output gap shrank slightly for the July-September quarter of 2018, mainly due to the effects of natural disasters. Inflation expectations have been somewhat weak, as indicated in the right-hand graph of Chart 7. I am convinced that this is attributable to the adverse effects of prolonged deflation in the past and recent weak price developments. In addition, in my view, the credibility of achieving the Bank’s 2 percent price stability target has not been sufficiently enhanced among the public, and this is also affecting inflation expectations. Turning to the outlook for prices, the medians of the Policy Board members’ forecasts for the year-on-year rate of change in the CPI (all items less fresh food) presented in the January 2019 Outlook Report are 0.8 percent for fiscal 2018, 0.9 percent for fiscal 2019, and 1.4 percent for fiscal 2020, excluding the direct effects of the scheduled consumption tax hike and policies concerning the provision of free education (Chart 4).3 Price projections have continued to be revised downward, reflecting the weak price developments, but the Bank’s view is that the momentum of prices toward the 2 percent price stability target will be maintained. However, I dissented from the relevant description in the January Outlook Report as I think the possibility of the inflation rate rising toward 2 percent is low at the moment and that the momentum of inflation has not been strengthened. There are four main reasons behind my position. First, under the present circumstances, the effects of a widening of the output gap on inflation might have become less pronounced.4 Second, there is a possibility that the expanding trend of the output gap will not continue. If the expanding trend of the output gap becomes even more robust, firms will likely increase prices and wages to better reflect a rise in costs and a tightening of labor market conditions. These firms’ moves will likely progress more than an increase in households’ tolerance of price rises. However, taking account of the outlook for Japan’s economy, I consider that there is a strong possibility that the expanding trend of the output gap will rather abate going forward.5 Third, based on the first two points, there is little prospect for the time being of an increase in inflation expectations through the adaptive formation mechanism pushing up the observed inflation rate. Fourth, it is unlikely for inflation to be spurred by an increase in inflation expectations on the back of an enhancement of the credibility of achieving the price stability target. This is because such enhancement is unlikely in a situation where the monetary policy remains unchanged amid downward revisions to the Policy Board members’ price projections. If a reduction in charges for mobile phone services takes place, it is expected to put downward pressure on prices in the short term. From the second half of 2016 through 2018, the output gap estimated by the Bank’s staff widened from a level of excess supply to excess demand of around 1.5 percent. Meanwhile, the year-on-year rate of change in the CPI for all items less fresh food and energy remained more or less unchanged at around 0.3 percent. As I mentioned in section I. B., the pace of pick-up in Japan’s economy will likely be slow from the scheduled consumption tax hike in October 2019 onward, mainly considering the following factors: in a situation where the pace of expansion in consumption since fiscal 2014 has been quite slow, households’ sentiment indicators have continued to decline since 2018, and the heightening of uncertainties in the global economy might limit business activity to a certain degree through expectations of a slowdown in external demand. Let me first outline the Bank’s current monetary policy, based on the outlook for economic activity and prices that I have described. I would then like to touch on my opinion about the Bank’s monetary policy conduct. The Bank conducts monetary policy under the framework of Quantitative and Qualitative Monetary Easing (QQE) with Yield Curve Control, aiming to achieve the 2 percent price stability target. This current framework consists of three major components (Chart 8). The first is yield curve control, in which the Bank sets the short-term policy interest rate at minus 0.1 percent and the operating target for long-term interest rates at around 0 percent. As for long-term interest rates, the Bank purchases Japanese government bonds (JGBs) while allowing some degree of fluctuation in long-term yields, depending mainly on developments in economic activity and prices. The second component is the purchase of risk assets, including exchange-traded funds (ETFs). The Bank purchases ETFs so that their amount outstanding will increase at an annual pace of about 6 trillion yen. With a view to lowering risk premia of asset prices in an appropriate manner, the Bank may increase or decrease the amount of purchases depending on market conditions. The third component is the Bank’s public commitment regarding the future conduct of monetary policy. In July 2018, the Bank introduced forward guidance for short- and long-term interest rates, stating that “[t]he Bank intends to maintain the current extremely low levels of short- and long-term interest rates for an extended period of time, taking into account uncertainties regarding economic activity and prices including the effects of the consumption tax hike scheduled to take place in October 2019.” The Bank aims to strengthen market confidence and expectations regarding the sustainability of monetary easing by making a commitment to the levels of future policy interest rates, in addition to the inflation-overshooting commitment regarding the monetary base that has been in place since September 2016. Furthermore, I have a difference of opinion regarding the Bank’s monetary policy conduct of continuing to persist with current monetary easing until the price stability target is achieved. It is necessary to pay due attention to the fact that sustaining the situation where the output gap is in positive territory over a prolonged period under bold monetary easing entails the risk of accelerating business and financial cycles thereafter.9Due attention is also required to the fact that, if monetary easing is continued for a protracted period, achieving the price stability target would become less clear as uncertainties regarding the outlook for the economy would be prolonged. In addition, the longer monetary easing is continued, the higher the burden on an exit strategy becomes, and the more the side effects of monetary easing accumulate. Therefore, I believe that in considering the possible side effects, the discussion should be centered on finding ways to achieve the price stability target at the earliest possible time in order to prevent monetary easing from continuing for a protracted period. Specifically, I consider it necessary to strengthen monetary easing so that yields on JGBs with maturities of 10 years and longer would broadly be lowered further. Specifically, I consider it would be necessary for the Bank to make a commitment to taking additional easing measures if it revised downward its assessment of medium- to long-term inflation expectations. Given that the output gap in Japan was in negative territory for a long period, some would argue that it is necessary to maintain the output gap within positive territory for a long period in order to change the structure in which the inflation rate has remained at a low level. In view of the risks I mention, however, I believe that it is best to achieve the price stability target at the earliest possible time, not only by widening the output gap within positive territory, but also by raising inflation expectations through strengthening the Bank’s commitment. Let me now take a slightly different approach and talk about Germany’s industrial policy. I am assuming many of you have heard the term “Industrie 4.0” in relation to Germany’s industrial policy. In my understanding, “Industrie 4.0” is a strategic initiative that aims for the self-optimization of production, not only by improving the efficiency of production processes and the quality of products and making small-batch production of a large variety of products using digital technology, but also by predicting changes in business environment and enhancing the ability of production to adapt to such changes. In other words, “Industrie 4.0” goes beyond the idea of digitizing production processes; it embodies the concept of optimizing production activities using digital technology so that they are able to adapt to environmental changes. “Industrie 4.0” is a national strategic initiative which was set forth by the German federal government in 2011. The federal government continues to play a leading role in implementing the policy. The framework of “Industrie 4.0” in Chart 9 shows the involvement of the government, with ministers of the federal government serving as chairs, and an organizational structure which encourages extensive cooperation across the public, private, and academic sectors, including industrialists, labor unions, and research institutions, as well as within each sector, from the management level to the field level. In other words, the government not only drafts the basis of the strategy and promotes the policy, but a structure has been established in which the government also gathers opinions and concerns from small and medium-sized enterprises in order to spread the effects of the policy to the very end of the value chain. Moreover, a virtuous cycle in which cooperation among the public, private, and academic sectors is strengthened has become possible, partly because ministers of economic affairs in German state government are often highly specialized and researchers at institutions such as universities are very keen to have their findings used in business. In addition to the federal government’s “Industrie 4.0,” local governments in Germany are active in supporting start-ups as a means to promote industrial development. Knowledge, skills, and funds are all essential throughout the process of starting up a new business: from the early stages of generating business ideas and developing business plans, through raising funds and merchandizing products, until the business can finally stand on its own. In each of these stages, the local government provides considerable support and invests in the new business on its own behalf to actively fulfill its role as a catalyst to encourage investment in newly established enterprises. As indicated in Chart 10, Japan and Germany have common features in that the share of manufacturing in all industries is large, and that the birthrate is declining and the population aging. Although the pace of aging for managers of small and medium-sized enterprises has been more moderate in Germany compared with Japan, smooth business succession and the development of newly established enterprises are important tasks for Germany as well. Another common challenge is that both Japan and Germany need to enhance added value for their domestic manufacturing in order to tackle the intensification of global competition in manufacturing industry caused by the rise of emerging economies. On the other hand, there are also differences between Japan and Germany. One particularly significant difference is that small and medium-sized enterprises in Germany are more active in expanding their businesses overseas and exporting their products than those in Japan. As a result, there are many “hidden champions” in Germany — that is, enterprises that have global market shares and are leaders in a particular niche business area. Given the declining birthrate and aging population, I believe that there are many lessons Japan can learn from Germany’s industrial policy and from its small and medium-sized enterprises. Germany’s industrial policy aims to enhance the added value in domestic industries through extensive cooperation across and within the public, private, and academic sectors, and it places importance on supporting innovative enterprises. Small and medium-sized enterprises in Germany seek to expand their businesses overseas on their own in search of new markets unlike those in Japan whose overseas business expansion typically depends on the corporate groups they belong to. Since Japan and Germany share many common features, I believe that they can expand each other’s business opportunities by strengthening their cooperation. On February 21, 2019, the Executive Board of the International Monetary Fund (IMF) discussed a paper setting out the current state of international corporate income tax arrangements. The policy paper Corporate Taxation in The Global Economy, explores options that have been suggested for their future development, including several now being considered in global fora and considering the contribution of the Fund to debates and processes now underway. The IMF is not a standard setting body in this area. Intensive discussions of possible changes to the international tax system are now underway in the Inclusive Framework on Base Erosion and Profit Shifting (BEPS)/the OECD, and the paper is intended to complement that work, reflecting the distinct contribution that the IMF’s broad membership, mandate, expertise and capacity building work position it to make. The paper builds on an earlier IMF analysis (2014), which stressed the macro-criticality of international corporate tax arrangements, the importance of cross-country spillovers in analyzing corporate tax reform and the particular vulnerability of low income countries to profit shifting activities. The paper discussed on February 21 continues these themes. It provides an update on what has been achieved, an account of remaining challenges, and a high-level overview of key economic aspects and implications of alternative schemes, some of which are now under discussion. Finally, it stresses the importance of fully inclusive cooperation in this area and reflects on the supportive role that the Fund can play in this context. The paper notes the considerable positive developments achieved since the previous paper was discussed, including the G20/OECD BEPS project and the expansion of the OECD’s body for reaching consensus around these issues to include over 125 countries in the new Inclusive Framework. It notes too, however, that issues remain in continued opportunities for profit shifting, and that concerns regarding tax competition and, more fundamentally, the allocation of taxing rights across countries now underlie much of the discussion within the Inclusive Framework. The paper does not endorse any specific proposals for international tax reform. It recognizes that views differ widely. Rather the paper identifies and discusses potential criteria by which alternatives might be assessed—with special attention to the circumstances of developing countries—and provides some empirical analysis to support discussions. The paper stresses the need to maintain and build on the progress in international cooperation on tax matters that has been achieved in recent years, and in some respects now appears under stress. It considers the supportive role that the Fund can play in this context, including by drawing on its capacity building work to inform the standard setting that others lead, and stresses the importance of cooperation among the international organizations active in this area, including through the Platform for Collaboration on Tax. Executive Directors welcomed the opportunity to take stock of recent developments in international aspects of corporate taxation, and offered preliminary observations on alternative proposals currently being debated. They acknowledged the importance of these issues to all Fund members in their efforts to raise revenues in an efficient and equitable manner, and the potential for significant cross‑border spillovers. Directors welcomed the significant progress made in addressing corporate tax avoidance and enhancing multilateral cooperation, notably by the G‑20/OECD project on Base Erosion and Profit Shifting, and the Inclusive Framework that has broadened the scope of cooperation to many non‑OECD countries. At the same time, they noted that there remain shortcomings in current international tax arrangements, and that many countries face pressures to introduce unilateral action. Directors agreed that much remains to be done to find sustainable global solutions, building on the progress achieved so far to ensure fairness, inclusiveness, and broad consensus, although their views differed on the extent of needed reforms and the roles of relevant bodies. As an important element of the current debate, Directors welcomed the discussion on tax challenges associated with digitalization. They recognized that this is a difficult issue, technically and politically, and that views on whether special treatment is needed, and if so in what form, continue to differ widely. For the long term, a number of Directors considered that it would not be desirable or feasible to design ring‑fenced solutions. Directors looked forward to the final report from the OECD to the G‑20 in 2020, which could serve as a basis for a cooperative approach going forward. Directors noted other challenges that have yet to be fully addressed. They welcomed the emphasis in the paper on profit shifting, which is a particular concern for developing countries. They also pointed to the damage from continued harmful tax competition, including the risk of a race to the bottom, while recognizing the importance of respecting national sovereignty in tax matters. Some Directors were of the view that the benefits of fair tax competition should also be acknowledged. Directors noted that views on the relative merits of alternative reform proposals vary to a great extent. They emphasized that much depends not only on the detail of specific proposals and their implementation but also on the relative importance attached to the various assessment criteria. Noting the tentative nature of the staff assessment, Directors stressed that it should be interpreted and communicated with caution. While Directors considered it too early to endorse any of the particular alternatives, they found the discussion a useful analytical complement to existing debates. Specifically, many Directors saw the benefit of minimum taxation in dealing with harmful tax avoidance and profit shifting practices. Directors emphasized that, to better inform the ongoing debate, considerable further analysis of the reform proposals is needed with respect to legal issues, practical consequences, including distributional effects, and implications for various groups of countries with similar or unique characteristics. Directors underscored the need for an inclusive process for discussing international taxation, especially as fundamental issues in the allocation of taxing rights come under discussion. Many Directors felt that the current governance arrangements, with the OECD as a central body and standard‑setter and supported by the Inclusive Framework, are broadly appropriate. At the same time, many Directors saw room for improvements, including to enhance the representation of developing and low‑income countries in the decision‑making process. Directors emphasized the important role of the Fund in the area of international corporate taxation, focusing on its universal membership, macroeconomic perspective, and analytical expertise. They stressed in particular the value of Fund advice and extensive capacity building, helping member countries to implement best practices on tax policy and administration. While recognizing that the Fund is not a standard‑setting body in international taxation, they noted that the Fund is well placed to undertake economic analyses of the impact of possible changes, both within and across countries, as well as to ensure that their implications for developing countries are adequately considered. In this context, most Directors advocated a more active role for the Fund in providing analytical contribution, influencing the debate, and fostering broader cooperation. A number of Directors stressed that efforts to bridge data gaps would need to take account of confidentiality issues and limited capacity in many developing countries. Directors underscored the importance of continued close collaboration with the OECD and other international organizations active in this area, to ensure that the Fund’s work remains complementary to, and avoids duplication of, that of others. They noted that the Platform for Collaboration on Tax provides a useful framework for bringing together the IMF, OECD, UN, and World Bank, and could continue to play an active role in supporting international tax coordination. I would like to welcome you all to this important session on the development and financial inclusion of small- and medium-sized enterprises (SMEs) in the Arab region. I am very grateful to Minister Al Tayer and the U.A.E. authorities for co-hosting this event with us and for their hospitality. Around this time last year, during the 2018 Marrakesh Conference, policymakers across the region made it clear that making growth more inclusive is a top priority. Arab countries have made progress, but there is still much to be done to increase growth and job opportunities for all. Increasing financial access came up as a key aspect of SME development and the inclusive growth agenda. Over the past year, we have looked closely into international experience and policies to increase SME financial inclusion. We are now proposing to operationalize this agenda to better serve our members. I will say a few words about: (i) “why” focus on SME financial inclusion; (ii) “how” countries can create an enabling environment for SMEs to flourish; and (iii) another “how” – how the Fund can support its member countries on these critical efforts. Turning to my first point: financial inclusion for SMEs is macro-relevant. Why? Because SMEs help create jobs, diversify economies, and support growth. In the Arab region, SMEs represent 96 percent of registered companies. They also employ half of the labor force. Yet their access to finance is the lowest in the world: lending to SMEs in the region is only 7 percent of total bank lending. – It could boost annual economic growth by up to one percent, potentially leading to about 15 million new jobs by 2025 in the Arab region. – It could also increase the effectiveness of fiscal and monetary policies, by improving domestic revenue mobilization and monetary policy transmission. It is clear then, that supporting and enabling SMEs is a key component of any inclusive growth agenda. So how can countries go about creating the necessary environment for SME development and financial inclusion? Based on our recent research, we found that promoting SME financial inclusion requires a holistic approach. To achieve meaningful, safe and sustainable SME access to finance, there is no magic bullet. And partial approaches are unlikely to suffice. A range of economic and institutional factors are needed to help scale up SME bank credit. Three common determinants stand out. First, sound economic fundamentals and financial sectors . This means curbing the size of the state where it crowds out financing for SMEs and creates an uneven playing field with SOEs. It also means a sound and competitive economy and banking sector that facilitate market entry for SMEs. Second, institutional factors are also essential . This includes good governance and financial supervisory capacity, availability of credit information, and strong legal frameworks. For example, our research shows that increasing the coverage of credit bureaus in the Arab region could raise employment, especially by SMEs. Third, harnessing the potential of alternative channels of SME finance . For example, by tapping capital markets and supporting the development of SME capital market segments. Fintech is also a potential game changer for SMEs: it can increase competition among credit providers and expand credit information. The IMF can better support Arab countries in this area. Like in other regions, several Arab countries, such as Egypt, Jordan, and the U.A.E., have started to implement comprehensive strategies to increase financial inclusion, including for SMEs. Based on our recent work, we plan to provide advice that is more granular and tailored to each specific country needs and reflects international experience. We will also coordinate our support with other regional and international organizations. Our new paper on SME financial inclusion will be launched on Tuesday in Cairo. We hope that this will mark the start of a deeper engagement with our members in this important policy area. But the measures adopted in the trade dispute between the United States and China are likely to be having an impact as well. 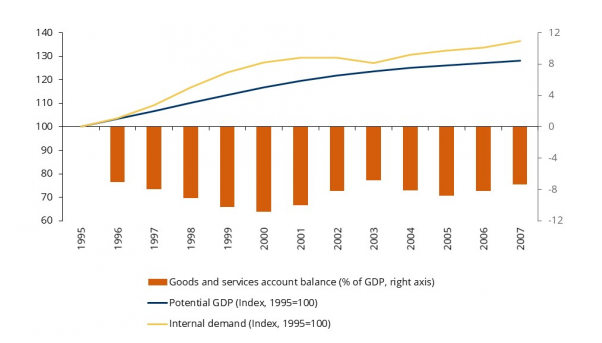 A model-based analysis by the Bundesbank indicates that the adopted trade barriers could shrink the two protagonists’ respective output levels by 0.5% over the medium term, and world trade would diminish by 1%2. Other economies, not least Germany’s, would also take a hit, albeit a milder one. As you can see, I’m not trying to gloss things over. But at the same time, there’s no reason for excessive pessimism. To coin a phrase, one protracted dip in growth does not a crash make – in other words: I see neither an abrupt slump nor an extended spell of noticeably receding economic activity. However, the Bank of England warns of short-term disruptions to trade which could plunge the UK economy into recession. The “Old Lady of Threadneedle Street” simulated a variety of scenarios to reach these conclusions4. In the worst case scenario, UK GDP might slump by as much as 8%. That would be a more severe recession than after the financial crisis, and it wouldn’t leave us unscathed, either. Amidst all the urgent questions currently being thrown up by Brexit and the trade dispute, there is one thing we mustn’t lose sight of: the truly profound challenges facing the euro area are long-term in nature. The European Commission’s estimates put its long-term growth potential at just 1.3%6. There is still room for improvement here, as shown by a current report of the European Commission. For the “digital public services” criterion, Germany came in just 21st out of the 28 EU Member States7 . The report identifies Germany as one of the EU countries with the lowest level of online interaction between authorities and citizens. Only 39% of the population use electronic public services. By way of comparison, the figure in Estonia is 96%. Thus, Friedrich Heinemann, an economist at the Centre for European Economic Research in Mannheim, has been critical of the fact that the interpretation of debt rules is being increasingly steered by political interests. In his view, the European Commission has disqualified itself as a “neutral arbiter”11. Now, while you don’t have to agree with each and every one of his clear statements, it is difficult to deny that the fiscal rules’ credibility has taken a hit and that their binding force urgently needs to be strengthened. In principle, this common backstop is appropriate because euro area’s significantly important banks are already subject to joint supervision. But before it comes into force, banks’ balance sheets need to be free of legacy assets. If not, risks that arose under national responsibility would subsequently be communitised.